The nature of ephemeral material means it can be an elusive source and its importance is frequently underestimated. Individual items may seem trivial but as a combined resource, ephemera offers insights into the past. As defined by Dr John Johnson, printer to the University of Oxford 1925-1946, ephemera can be any printed material that is not a book, and is commonly seen as a printed item that would ordinarily be thrown away. As such, much material has not survived, and what has done so is often in poor condition. Nevertheless, as a tangible link to the everyday life of the past, it can be an important historical source. Ephemera can also provide evidence of the changes in the history of printing, with new techniques and processes often showcased through printer’s advertisements and letterheads. 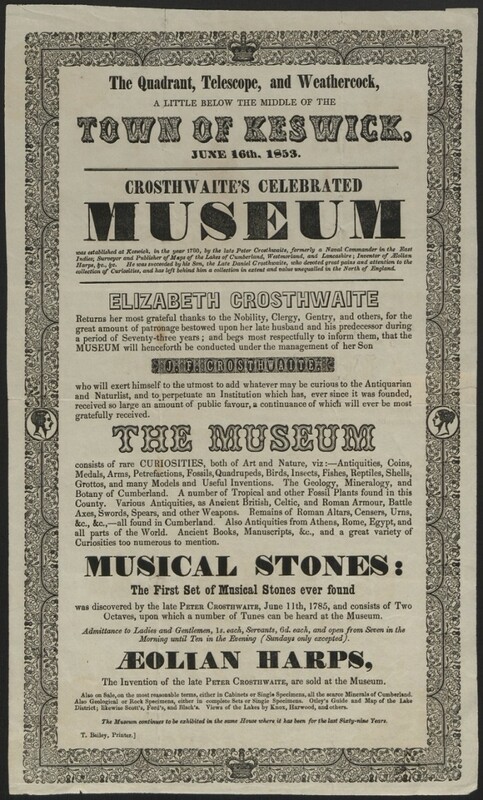 The museum prints collection houses ephemeral material ranging from broadsides, advertisements, postcards, to lecture and exhibition notices.